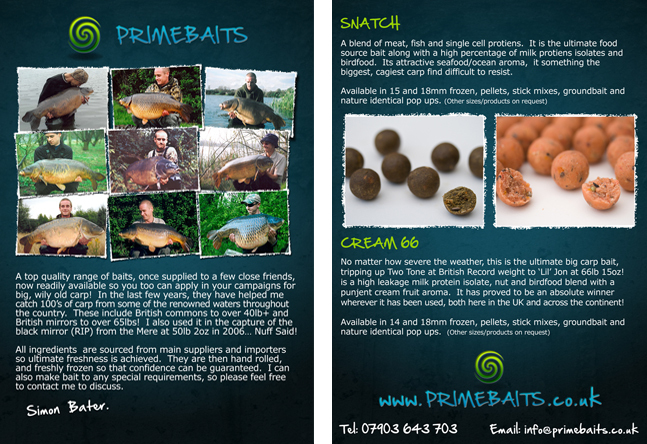 Simon Bater, a good friend of iAngler, approached us with a vision of creating him a brand for his bait production company, Primebaits. This bait, being a little special compared to its competition, needed a logo and identity which was unique, modern and something that would be recognizable if seen on clothing or packaging. Primebaits was born, and iAngler created the website, Logo and branding. Simon needed a portable means of advertising for when he was in his second office, by the side of a lake, when an internet connection was off limits. These flyers are double sided, and showcase the portfolio of fish the bait has fooled, along with crucial information about the bait itself, and contact details. The attractive design started generating sales from the moment the flyers were cut off the printers press.